Do you ever have mixed feelings when you pick up a book by an author you’ve heard plenty about but never actually read yourself? It’s like a blend of excitement that you may have just stumbled onto something great and apprehension that you’ll be disappointed. While the disappointment always stinks, finding a winner more than makes up for the flops and from the moment I started reading Her Last Day I knew that I had found a new favorite author! This opens with an intense prologue that hooks you instantaneously, it’s fast and furious and that pace never lets up for one minute. It’s the beginning of a new series featuring Jessie, a PI with a troubled, complicated past who is flawed in the absolute best way. While I felt like I had a decent sense of who she is there is so much more to explore with her both in her personal life and her work life. It’s mostly told through the eyes of Jessie and Ben, a reporter that works cold cases, but there were chapters featuring the nameless serial killer that chilled me to the bone. The Heartless Killer is sadistic and twisted, there are some truly creepy moments that will make your skin crawl. This was an effortless page turner, I absolutely flew through it, desperate to see how Ragan would weave various plot threads together. The chapters are short and snappy, the type that keep you up well past your bedtime, these type of reads are my hands down favorite. I’m so excited that Ragan has an extensive back catalogue that I can explore as the next book in this fantastic series won’t be out until next spring! No… this one was my first! But I want to! Ohh! let me know your thoughts then! Hi! Which book you grabbed? There’s a deal today for one of her series in Goodreads. I believe is Abducted and Dead Weight. Actually the whole series (6 books) are also $1 each. I’ll try the first one then I will see! Oh that’s great, keep me posted! 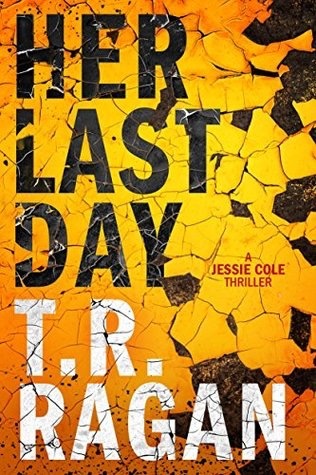 Check out the book, Her Last Day, by T.R. Ragan, as featured on the Novel Gossip blog.